1 Samuel 8:1-7 (IEB): “When Samuel became old, he appointed his sons as judges over Israel. His oldest son’s name was Joel, and his next son’s name was Abijah. They were acting as judges in Beer-Sheba. However, Samuel’s sons did not live the same way he did. Instead, they tried to get money dishonestly. They took bribes. They twisted justice to obtain money. (a) See Numbers 23:21; Deuteronomy 33:5; 1 Samuel 10:18-19; (12:8-12; I’ll cover in a future study); Jer. 10:7,10. As I leave my study today, there is no doubt in my mind that God is my King and He deserves my reverence. It is also clear that He will let me walk away from Him. It is my responsibility to keep my focus on His will and to serve Him, not the other way around. In 1 Samuel 8:8-17 God tells Samuel to warn the Israelite people that the ruling king would exercise his special privileges over them. He will take their sons and daughters and will make servants of them. He’ll take their best fields, vineyards, and olive trees. He’ll tax the people 10% on their produce and flocks, and make all of the people his servants. (b) 8:21 literally, “Each one, go to his town.” Perhaps Samuel wanted them to reflect more on the serious implications of such a proposed, radical change of government. 1 Kings 12:4 (IEB) The people said to King Solomon’s son Rehoboam: “Your father forced us to work very hard. Now, therefore, make things go easier for us. Do not make us work as hard as your father did. Then we will serve you.” But Rehoboam was even harder on them. Jeremiah 22:13-17 (IEB) Jeremiah gives a message from Yahweh to the Kings of Judah: “How terrible it will be for him who builds his palace by doing wrong. He cheats people, so that he can build its upper rooms. He is making his own people work for nothing. He’s not paying them for their work. He thinks: ‘I will build a great palace for myself. I will have large upper rooms.’ So, he cuts out big windows for it. He uses cedar wood for the walls. And, he paints it red. Does having a lot of cedar wood in your palace make you a great king!? No. Your father was satisfied to have just food and drink. He helped those who were poor and needy. So, everything went well for him. That is what it really means to know Me!’ says Yahweh. The Israelites had served God but now they wanted to “be just like all the other nations”. They wanted to serve an earthly king. Why is it that we always seem to want what the world has, when we already have a far better life under God’s control? (b) Officially rubbing the candidate with oil signified his separation to Yahweh for a particular task as well as preparing that person with divine guidance. Saul was just trying to save the lost donkeys, but God had other plans. His plan was to have Saul rule over His people. Although at times the Israelites appear to be just as stubborn as those donkeys, God has heard their cries for an earthly king. I leave my study today reminded to be careful what I ask for. Samuel told Saul the missing donkeys that he was looking for had been found. He also told him that all that was worth desiring of Israel belonged to him (Saul). Saul was confused because he was from the smallest tribe in Israel, and his clan was the least important clan within the tribe of Benjamin. Later Samuel and Saul went into town and Samuel talked to Saul. Saul spent the night on the roof of Samuels home. At dawn the next morning Saul left the house with Samuel. At the edge of town Samuel told Saul to send the servant on ahead, but asked Saul to stay a moment because Samuel had a special message for him. (c) This act shows how God selected a man to be king, thus making him the earthly representative of the heavenly King (God). It was like crowning someone as king. “Messiah” (“Christ”) means “the anointed one”. As I leave my study, I see again that God is in control! It was no accident those donkeys got loose, because the search brought Saul right to Samuel, right where God wanted him. Samuel was faithful, and God told him everything about Saul (and his donkeys)! Saul was the human king the people demanded. Christ is the King of God’s plan. His plan for me is always so much better than what I think I want. Samuel gives Saul three proofs that what Samuel has said is true and from God. I leave my study today praising God for the clear instruction found in His word. The three proofs come true. Samuel gave Saul 3 proof to show that what Samuel had told Saul was true and was from God. Following the footnotes: (c) This was a proverbial statement of surprise. Saul was known for becoming the first king of Israel; he was not known for being a prophet. Just as Samuel had said; Saul was changed into a different person. So here we have evidence that all of the proofs were fulfilled. As I leave my study today I am reminded again how powerful our God is. What He says is always true! 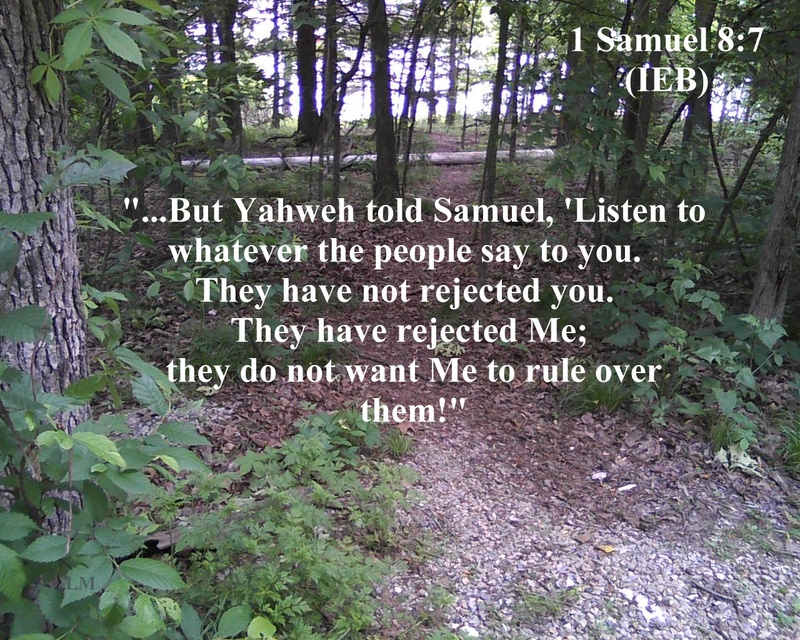 Samuel calls the people to the presence of Yahweh. Following the footnotes: (a) The purpose of this assembly was to reveal god’s choice to the people of Israel and to define what the new king could and could not do. My thoughts: He was hiding behind the baggage!? This is the man who will lead the Israelites? As I leave my study today I realize that Saul was the physical image of what the world values. He was tall and good-looking. He had the physical attributes of a leader, but not the character. Of course this may have been just the point that God was making. Saul meets the demands of the Israelites for an earthly king, but will only be able to defend Israel with God’s help. Whether the Israelites like it or not – God is the only real King.